“I LOVE NEWARK AIRPORT!” Those are the first words out of my mouth as I wander into the United Airlines Red Carpet Lounge in Terminal A of Liberty International Airport, also known as EWR, also known as Newark, New Jersey, USA. The words are dripping with sarcasm. It has not been the best of weeks for me. I am working, literally, in MON, New Jersey. MON is an acronym I just made up this week, which stands for Middle of Nowhere. It is a much more polite way of saying that I am surrounded by farmers’ fields and dense forest than the usual saying I use, which people who are familiar with the type of terrain that the phrase “squeal like a pig” was uttered in during the movie Deliverance will understand. It’s a very, very strange area I am in. I have talked, I thought, quite lovingly about my time in New Jersey up in Rutherford in previous blog entries. Rutherford is a quiet suburban existence, close to New York City, similar to the place where I grew up outside of Toronto. My new client in New Jersey, though, is located in space not at all like Rutherford, which isn’t to imply that I am in some rural backwater with nothing but sheep, cows and the occasionally tractor. In fact, Basking Ridge, New Jersey, where I find myself now, is probably as crowded and dense as Rutherford. However, it’s obvious that Basking Ridge used to be a rural area that has grown, rather ineloquently into its role of suburb of New York City. On my way from my hotel, a nice Marriott off highway 78, to the client site, which is a massive complex beautifully designed by famed architect I.M Pei, I drive along twisty country roads and wide-open highways. The twisty country roads, though, are lined with large suburban houses. There are no sidewalks and no street lamps, as one might expect in the suburbs, just large, expensive houses along two-lane blacktops. The hourses are spaced not even 100 feet apart, and so traffic along these country lanes, built for occasionally tractor and pickup traffic, is bumper to bumper. In my two weeks down in Basking Ridge, I have seen many a dead deer lying by the side of the road, mowed down in a vain attempt to cross the street through the constant stream of traffic. Once I get on the highway, the traffic is a crawl. There is nothing on either side of the highway but empty forest and farmland, and exits are spaced four to six miles apart. I finally reach the client site, and spend my entire day there, as there is nowhere to go to grab a coffee or a quick lunch other than the cafeteria on site. I was thinking to myself, as I was driving from the client site to Newark airport on Thursday how much I miss working in a city, where I can pop out for lunch and have a million choices, where I can get by without having a car, where I can find dinner that doesn’t involve a 15 mile drive to a decent restaurant. My mood does not improve as I arrive at the airport and find that my flight has been delayed 2 hours. Newark airport is one of three airports in the New York City area, which is the busiest air space in the United States. All three airports (JFK and La Guardia being the other two) suffer from chronic delays, even when the weather is good. Today, the weather is bad, and so the delays are even worse. I find myself with a lot of time to kill and Elite status in the Star Alliance network of airlines, which includes both Air Canada (which does not have a lounge at Newark) and United Airlines (which has the Red Carpet Lounge at Newark), so I head into the Red Carpet Lounge for a drink, a comfortable seat and a few slices of cheese. I sit at the bar and try and work on the Suduko in the USA Today, but kind it hard to concentrate because the TV, tuned to CNN, keeps showing those ads in Australia’s so where the bloody hell are you? campaign. The ones with the beautiful shots of Australia’s coastlines and outback and charming, tanned beauties in bikinis. I look outside at the grey tarmac of Newark Airport, and watch the cold rain splatter on the pavement. Makes me wish I was somewhere else instead. I finish the Sukudo, and flip through the USA Today’s Life Section. The USA Today and ABC’s Good Morning America are revealing the new 7 wonders of the world. Today’s entry is Chichen Itza in the Yucatan peninsula of Mexico. Chichen Itza was one of the major cities of the Mayan Empire. The Mayan civilization flourished in the area we now know as Central America from about 250 A.D. until a mysterious collapse in the 8th and 9th centuries. Chichen Itza survived as a major centre even after the collapse of the Mayan empire, but by the 13th century, the city was abandoned and left to become overgrown by the jungle. The Mayan people didn’t disappear. They still exist in Mexico and Central America today. They just gave up on city living and decided to return to farming. The reason for the Mayan civilization collapse is debated, and many possible explanations exist, including warfare, famine, environment collapse and disease. As I am sitting in Newark Airport, I come up with my own theory, which I call urban exhaustion. The Mayan people, living in big cities like Chichen Itza, sitting around in the cartport, waiting for a cart to take them to Tulum that had been delayed 2 hours, and finally just said, “that’s it, I deserve better than this!” They walked away from the cities, and its traffic jams of llamas and carts, and decided for a more rural existence. I must admit that it’s an attractive suggestion, walking away from this stressful urban life of travel, trading in my laptop for plowshares. 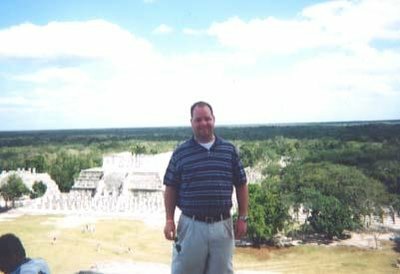 I’ve been to Chichen Itza, back in February of 2000. It was my first trip outside of either Canada or the USA, to an all inclusive resort in Cancun (Cancun, woo-hoo!). The day trip to Chichen Itza was a quick break in what was otherwise an all-inclusive drinkfest. It’s strange to think that only 6 years ago I hadn’t really been anywhere. I’m not sure if you, dear reader, has been to Chichen Itza, but it probably wouldn’t surprise me if you had. It is very close to the resorts of Cancun, and is a very popular day trip for Cancun tourists. Even if you haven’t been to Chichen Itza, fear not, for I know that one of the new seven wonders of the world you HAVE been to. One of the other new wonders (the one announced today, Friday, November 17) I’ve been to as well, the Serengeti in Tanzania. Now, observant readers or those good at math will notice that I’ve only listed 6 wonders so far. That is because, my friends, I promised that I know you have been to one of the new wonders of the world. The 7th wonder of the world is MY BLOG! Okay, maybe not my blog specifically, but the Internet, which contains my blog. So welcome to one of the 7 wonders of the world. I must admit, choosing the Internet as a wonder of the world seems a touch of a cop-out to me. It is not a physical place, but rather a concept. It would be like picking agriculture as a wonder of the world. Sure, without agriculture we’d still all be hunting and gathering, eating berries and getting attacked by elephants and squatting in dirty, muddy huts, which means agriculture is important. So perhaps agriculture is one of the world’s greatest concepts. But it’s no hanging gardens of Babylon. Anyway, I suppose it is ABC’s and USA Today’s game, so they can set the rules.